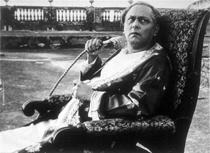 Overview - With The Music Room (Jalsaghar), Satyajit Ray brilliantly evokes the crumbling opulence of the world of a fallen aristocrat (the beloved actor Chhabi Biswas) desperately clinging to his way of life. His greatest joy is the music room in which he has hosted lavish concerts over the years—now a shadow of its former vivid self. An incandescent depiction of the clash between tradition and modernity, and a showcase for some of India’s most popular musicians of the day, The Music Room is a defining work by the great Bengali filmmaker. We all have our own special places. Small nooks and crannies, or wide, open spaces, hidden or public, where we come either alone or in company to break from the rigors and troubles of the world around us and celebrate our own passions and interests. For aging aristocrat Huzur Biswambhar Roy (Chhabi Biswas), that special place was his music room, an opulent hall filled with art, friends, and joyous song. It was his refuge, a place to embrace his loving obsession with the sounds of classical Indian music. It was his Eden. That is, until tragedy struck and cast it all in darkness and dust. From acclaimed Bengali director Satyajit Ray, 'The Music Room' is a simple but artfully constructed study of passion, changing times, and, of course, the ever-enduring wonders of music. The plot revolves around a wealthy landowner named Huzur Biswambhar Roy, who spends most of his money on extravagant musical recitals in his treasured music room. Despite his all encompassing addiction, Roy is still a loving husband and father, but tragedy unfortunately strikes, and the man is left in shambles, an aging relic of an era slowly dying. As India's feudal system is phased out, and Roy's way of life gradually becomes obsolete, the lonely man simply withers away in his dusty palace, unable to enjoy the melodies that once gave him such happiness. When his rival, Ganguly (Gangapada Basu in an amusing but sometimes over the top role), schedules a musical recital of his own, Roy considers the unthinkable, and contemplates once again opening up his now locked and neglected music room. The story is a simple but still richly textured character study, examining both the joys and pitfalls of passion, and the necessary tragedy that always comes with progress. As Roy, Chhabi Biswas gives a wonderful, complex performance, providing the character with a combination of childlike glee and longing sadness. In the early parts of the film, when Roy is in his music room listening to his favorite songs, we can truly see the wonder in his eyes, and when events eventually take their dark turn, Chhabi perfectly captures the isolation and despair of a man who chooses to lock himself away in decay and silence. In many ways there are even echoes of 'Citizen Kane' here, and certain shots of Roy sitting in the extravagant ruins of his once great home, evoke very similar themes and ideas as Welles's great masterpiece. 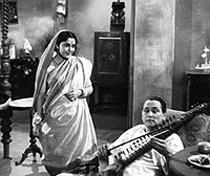 As its title might imply, music plays a very large part in the film, and director Satyajit Ray does a great job incorporating the extended musical performances naturally into the proceedings. Many of India's most famous and celebrated musicians, as well as some more unknown but soon to be popular performers, make appearances in the movie and give the musical numbers a great sense of authenticity. While the style of the music itself might not be for everyone, there is no denying the skill and artistry behind the work, and Ray captures it all with reverence and excitement. From a stylistic standpoint, the director employs a beautifully retrained method to his visual strategy. There is a quiet, contemplative mood to the compositions and camera movements, with many lingering, still shots and slow tracking sequences. The form of the images themselves, perfectly evoke the psychological mood of the main character, bolstering his internal struggle in a powerful but subtle way. Ray also uses several visual motifs throughout the film with close-ups of insects, flames, and mirrors acting as abstract symbols of foreboding and change. One scene in particular, is a great showcase of the director's command of movement and sound. When Roy is reinvigorated by his rival's new recital and decides to once again enter his own music room, the character slowly makes his way around the shadowy area. As he does so, the camera takes on a life of its own, tracking and panning through the empty, dark, filthy space as the soundtrack plays gentle echoes of music that once proudly boomed around the room. The scene is fairly simple in design and doesn't call too much attention to itself, but still manages to perfectly encapsulate the mood and emotions of Roy's journey. 'The Music Room' is a moving examination of our refusal to accept change and our inability to let go of what is already lost, as well as a stirring celebration of music and art. There are some small faults, including an occasionally over the top performance by Gangapada Basu, and a fairly thin overarching plot, but the film makes up for these minor shortcomings through sheer artistry and deep character work. While perhaps not quite as powerful as the director's celebrated debut film and enduring masterpiece 'Pather Panchali,' 'The Music Room' is still a worthy example of classic cinema. 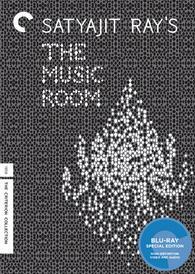 Criterion presents 'The Music Room' in their standard clear case with spine number 573. The BD-50 region A disc comes packaged with a booklet featuring an essay by critic Philip Kemp, as well as an essay by and interview with director Satyajit Ray. The movie is provided with a black and white 1080p/AVC MPEG-4 transfer in the 1.33:1 aspect ratio. While there are some issues with the source elements, the video still exhibits many positive qualities. The print is in rough to good shape, with the first half of the movie displaying some visible signs of age and damage, including frequent scratches, vertical lines, and pulsing. Thankfully, these issues do seem to lessen as the film goes on, but there are always at least faint signs of wear apparent. A natural layer of moderate grain is also present throughout. Despite the sometimes rough quality, the image demonstrates great levels of detail, showcasing the rich compositions and intricate layers of the cinematography with pleasing depth. Black levels are mostly deep but can fluctuate slightly and contrast is strong without being unnatural. The print isn't always in pristine shape, but the video transfer still manages to shine regardless. The movie is presented with a Bengali LPCM mono track with optional English subtitles. Music obviously plays a large part in the film, and the soundtrack shows off the classical Indian compositions and performances well enough. Dialogue is clean but can lack some depth. There is of course no surround use or directionality to speak of, but the sound design itself is well done and comes through in nice quality. Musical performances exhibit decent levels of dynamic range, but like the dialogue, there is a lack of fidelity in the recording. 'The Music Room' sounds about as good as it probably ever has, and though the mix can't compare to modern tracks, the artistry of the music and design is still strong. Criterion has put together a very nice collection of supplements including several interviews and a two hour documentary on the film's director, Satyajit Ray. All of the extras are presented in 1080p (unless noted otherwise) with Dolby Digital mono tracks and optional English subtitles (for the foreign language portions of the supplements only). For The Love of Music (HD, 18 min) - This is an interview with Ray biographer Andrew Robinson with stills of Ray and his films, along with clips from 'The Music Room' intercut throughout. Robinson provides a detailed and knowledgeable discussion on the director and film, offering interesting bits of history, trivia, and analysis, including talk of how the filmmaker got involved with the project, his love of music, and his focus on the internal psychology of his characters. Mira Nair (HD, 16 min) - Director Mira Nair offers her thoughts on the film and Satyajit Ray in this feature. Once again, clips and stills are intercut throughout the interview. 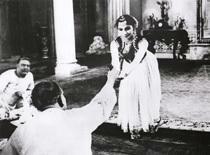 Nair discusses how she was first introduced to Ray's works and how difficult it was to see many of his films for several years. The filmmaker also details what she admires about 'The Music Room' and talks about her personal friendship with Ray. French Roundtable (HD, 11 min) - Presented in French and upscaled 1080i, this is an excerpt from a French television program featuring Satyajit Ray, critic Michel Ciment, and director Claude Sautet. The French critic and filmmaker praise Ray's work, and ask him a few questions about his approach to the material and music. Though a bit short, Ray does provide some nice insights (though dubbed over in French with English subtitles) that are definitely worth hearing. 'The Music Room' is an interesting, well crafted character study, and a loving celebration of the joys of music. Through its tragic main character, Ray reveals a culture in the midst of transition and growth that may no longer have a place for the once traditional staples of its past. The video reveals some definite age but still has several strengths, and the audio does a solid job of preserving the many musical numbers. Supplements are plentiful and offer some great insights on the director's style and full body of work, making this a good disc that definitely comes recommended.